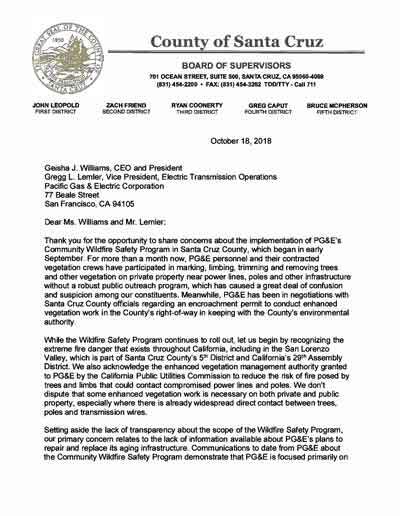 Responding to the confusion and controversy over PG&E’s precipitous, ill-conceived and destructive Wildfire Safety Program, Supervisor Bruce McPherson and State Assemblymember Mark Stone have co-signed this letter to PG&E’s CEO and President, Geisha Williams, along with Gregg Lemler, a VP and Michael Picker, CPUC President. 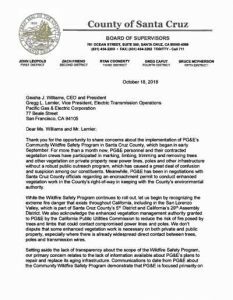 They recognize the wildfire problem but call them on three things: lack of effective communication (including the rights of property owners), removing trees and vegetation causing erosion and other major environmental problems, and the fact that it is PG&E’s own bare wires that are the problem and that infrastructure need is being ignored. Please let them know you support their effort and demand that they take even stronger action since the tree removals have not abated and are increasing. Sign the Petition! PG&E: Insulate Your Power Lines to Improve Fire Safety!